Background: Pre-eclampsia/eclampsia remains a high contributor towards maternal mortality and morbidity and also the poor perinatal outcome. Thus, timely prediction of the onset of eclampsia and starting appropriate treatment as early as possible is important for favourable maternal and perinatal outcome. However, there is a dearth of studies, especially in the Indian scenario which correlates the severity of pre-eclampsia/eclampsia and the cranial magnetic resonance imaging (MRI) findings, therefore, this study was planned to fill the lacuna. Material and Methods: A total of forty patients admitted in the department, of forty, twenty patients were diagnosed with eclampsia and twenty patients with severe pre-eclampsia. MRI was performed in all these 40 patients and they were divided into two groups. Group I (MRI findings positive n = 17) and Group II (MRI findings negative n = 23), the patients once had agreed to (with consent) were sent to MRI centre for MRI to be performed. All the data required along with the patients' sign and symptom were recorded in the pro foma designed for this study. Results: The difference in the study groups was statistically significant regarding headache, seizures, depression of consciousness and visual disorder (P = 0.0085, <0.0001, <0.0001, and <0.0001, respectively). 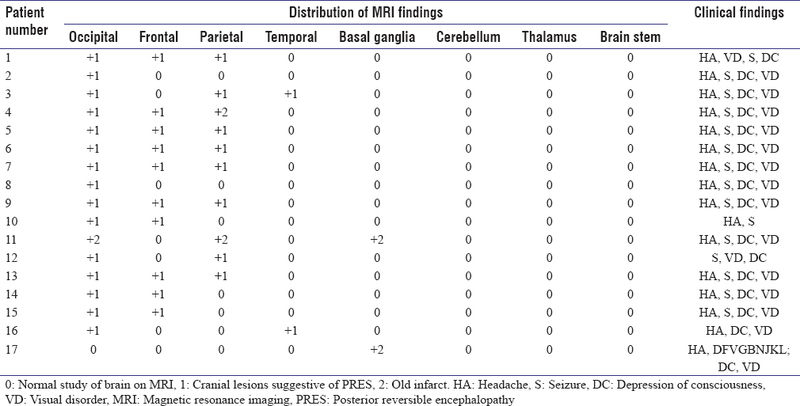 In MRI positive findings patients, the occipital cortex was involved in 100% of patients, parietal cortex in 58.82%, frontal cortex in 58.82% and temporal cortex in only 11.77% of patients. Basal ganglia had an infarct in 11.77%. Conclusion: We have observed patients suffering from severe pre-eclampsia and having positive cerebral findings on MRI scan, However employing MRI for screening is not cost-effective and large-scale randomised control trials are needed to further confirm the role of MRI in severe pre-eclampsia. Pre-eclampsia is defined as the new onset of hypertension (blood pressure [BP] ≥140/90) and either proteinuria or end-organ dysfunction or both after 20 weeks of gestational in women who was previously normotensive. When pre-eclampsia occurs in the early second trimester, the diagnosis of hydatidiform mole or choriocarcinoma should be considered. The incidence of eclampsia in India has been quoted as 1.56%. Eclampsia is associated with high maternal and foetal mortality and morbidity. The maternal mortality among cases of eclampsia was 31.8% and perinatal loss was 38.6%. A relatively high incidence of eclampsia with the maternal and perinatal loss was considered to be due to the lack of antenatal care and late referral to the hospital. Seizures in the first trimester or well into the post-partum period probably are due to CNS pathology and warrant full evaluation, including computer tomography (CT) scanning of the head, lumber puncture, determination of electrolytes levels and urine or serum toxicologic screening. Other neurologic causes of seizure should be considered, particularly, if the seizure occurs more than 24 h after delivery. In addition, rule out hypoglycaemia as cause of seizure and rule out hyperglycaemia as the cause of mental status changes. Transabdominal ultrasonography is used to estimate gestational age. This may also be used to rule out abruption placentae, which can complicate eclampsia. CT scanning of the head, with or without contrast, can exclude cerebral venous thrombosis, intracranial haemorrhage, and central nervous system lesions, all of which can occur in pregnancy and present with seizures. Although obtaining a CT scan in eclampsia is not routine, abnormalities have been observed in up to 50% of women imaged. Abnormal magnetic resonance imaging (MRI) findings of the head have been reported in up to 90% of women imaged. These include an increased signal at the grey-white matter junction on T2-weighted images, as well as cortical oedema and haemorrhage. The syndrome of posterior reversible encephalopathy syndrome (PRES), indicative of central vasogenic oedema, has been increasingly recognised as a component of eclampsia. Vasogenic oedema was reported to be seen in the parietal or occipital regions in 92% of patients, but the involvement of other brain regions in patients with PRES, such as the temporal lobes, brain stem, cerebellum, basal ganglia and frontal lobes, has also reported. Therefore, awareness of variations is important. The preferential posterior circulation distribution has been suggested to be due to the decreased sympathetic innervations of the posterior circulation. Vasogenic oedema occurs due to the failure of the protective cerebrovascular auto-regulatory mechanism in situations of high BP or circulation toxins, leading to consequent vasodilation and leakage of fluid into the interstitial tissue. Patients who had brain oedema also had evidence of more severe systemic disease than those who had normal MRI findings. As compared with patients without brain oedema, these patients had significantly increased uric acid and creatinine levels, which implied renal dysfunction. Seizures were more frequent in patients with brain oedema than in those with normal findings. This most likely reflects the irritative effects of fluid in the subcortical and cortical tissues. Some authors have suggested, on the basis of the common association of seizures with hypertensive encephalopathy, that the radiographic findings in patients with hypertensive encephalopathy actually may represent seizure oedema. In India, eclampsia remains a high contributor towards maternal mortality and morbidity and also the poor perinatal outcome. Thus, timely prediction of the onset of eclampsia and starting appropriate treatment as early as possible is important for favourable maternal and perinatal outcome. However, there is a dearth of studies especially in the Indian scenario which correlates the severity of pre-eclampsia/eclampsia and the cranial MRI findings, therefore, this study was planned to fill the lacuna. The cross-sectional clinical descriptive study was conducted in the Department of Obstetrics and Gynaecology in PBM and associated group of hospitals, Bikaner in the periods 2014–2015. A total of forty patients admitted in the department, out of forty, twenty patients were diagnosed with eclampsia and twenty patients with severe pre-eclampsia. MRI was performed in all these 40 patients, and they were divided into two groups. Group II (MRI findings negative): patients diagnosed with eclampsia/severe pre-eclampsia who had normal cranial MRI scan (n = 23). Patients with severe pre-eclampsia (BP of 160 mm Hg systolic or 110 mm Hg diastolic, recorded on at least two occasions at least 6 h apart with patient at bed rest, proteinuria of 5 g in 24 h, oliguria (400 ml in 24 h), cerebral visual disturbances, epigastric pain, nausea and vomiting, pulmonary oedema, impaired liver function of unclear aetiology or thrombocytopenia. Patients with known history of epilepsy, demyelinating disorders, cerebrovascular accidents or any neurosurgical procedures. The patients once had agreed to (with consent) were sent to MRI centre for MRI to be performed. The radiologist concerned was informed earlier before sending the patients. Patients who were admitted late at night or public holiday were stabilised and sent MRI room the next morning during office hours. All the data required along with the patients' sign and symptom was recorded in the pro forma designed for this study. 1.5 T MRI system was used. All statistical analysis was performed with the SPSS 18.0 version of software programme. This study showed the mean age of patients in MRI findings positive group was 24.47 ± 1.656 years and MRI findings a negative group was 22.00 ± 0.5864 years. Hence, the difference was statistically not significant (P = 0.1248) [Table 1]. The maximum number of patients (64.71%) in Group I had mean BP ≥140 mm of Hg, whereas in Group II, mean BP range were 120–129 mm of Hg, The difference between the two groups was statistically significant (P < 0.0001) [Table 2]. The difference in the study groups was statistically significant regarding headache, seizures, depression of consciousness and visual disorder (P value 0.0085, <0.0001, <0.0001 and <0.0001, respectively) [Table 3]. The total number of perinatal deaths was 41.18% in the MRI finding positive group whereas the perinatal mortality in the MRI finding a negative group was 21.74% [Table 4]. In MRI positive finding patients, the occipital cortex was involved in 100% of patients, parietal cortex in 58.82%, frontal cortex in 58.82%, and temporal cortex in only 11.77% of patients. Basal ganglia had infarct in 11.77% [Table 5]. The study aims at identifying the nature and distribution of the cranial lesions on MRI in patients suffering from eclampsia and severe pre-eclampsia, and their correlation with clinical data from these patients. PRES is a cliniconeuroradiological entity that was well-explained by Hinchey et al. in 1996 based on a short case series of 15 cases. PRES carries up to15% mortality rate, this is variably characterised by associations of headaches, visual abnormalities, seizure activity, consciousness impairment, nausea/vomiting and focal neurological signs. The brain imaging abnormalities are often symmetric and predominantly found in the posterior white matter. Recognition of PRES has become easier with increasing availability of MRI. The study done by Sanders and Clayman showed that MRI in eclampsia patients demonstrate hyperintense lesions on T2-weighted images while iso-to hypotense lesions are found on T1-weighted images. MRI lesions are most commonly located in the area of the posterior cerebral circulation and are associated with visual disturbances. Basal ganglia and subcortical white matter lesions are uncommon and are associated with mental status changes. Most of the MRI lesions in patients with eclampsia are reversible. Bartynski and Boardman showed that vasogenic oedema was most commonly present in the parietal or occipital regions (98%), but other locations were also common. The frontal lobes (68%), inferior temporal lobes (40%) and cerebellar hemispheres (30%) were affected often. The basal ganglia (14%), brainstem (13%) and deep white matter (18%) including the splenium (10%) were also involved although less commonly than the other locations mentioned above. Manfredi et al. concluded in their study that strict similarity with the pathological findings characterising hypertensive encephalopathy suggests that a focal impairment in cerebral autoregulation may be the cause of vasodilation and fluid extravasation leading to hydrostatic oedema. Posterior circulation areas are selectively involved because they have lesser degree of adrenergic innervations supporting circulation autoregulation mechanisms. In the present study, we found that among the eclampsia patients having abnormal MRI, the occipital cortex was involved in 100% of patients, parietal cortex in 66.67%, frontal cortex in 66.67% and temporal cortex in only 6.67% of patients. The subcortical region had minute haemorrhages in 1 out of 20 of the pre-eclampsia patient while none of the eclamptic patients had any lesions in the subcortex. Hence, posterior circulation areas are inadvertently involved in eclampsia patients. Adali et al., found that eclampsia and preeclampsia are considered as common causes of PRES, which is found to be the result of vasogenic brain oedema caused in turn by a rapid increase in BP. Imaging and clinical findings are usually reversible. Timely diagnosis and elimination of possible causes are important to avoid permanent visual or brain injury. Neuroimaging preferably MRI should be carried out in eclampsia patients with a visual disturbance to exclude other causes of blindness. Kanki et al. showed that both cytotoxic and vasogenic oedema occur in eclampsia and thus ischaemic brain injury that causes seizure is possible. However, the reversibility of neuroradiologic lesions and neurological symptoms within a few weeks postpartum in most of the cases argues against true cerebral ischaemic necrosis. In fact, clinical and neuroimaging findings correlate more with vasogenic oedema. In the present study, we found that clinical findings such as headache, seizures, depression of consciousness and visual disturbance reversed within 7 days of termination of pregnancy. Hence, the neurological findings we found were likely due to vasogenic oedema, and not cytotoxic oedema. McCormick et al. found that acute cortical blindness is the most alarming presentations of pre-eclampsia and is often found to be reversible. It is defined as blindness found in association with normal pupillary function and fundoscopy. Swende and Abwa showed in their case report that one of the rare effects of severe pre-eclampsia is a sudden loss of vision. This blindness was thought to be due to the involvement of the occipital cortex or the retina. Although very dangerous, this type of blindness is often reversible following right management of such patients. In the present study, we found that visual blindness manifested in 47.5% of the total eclampsia and severe pre-eclampsia patients. The blindness found in our study was associated with normal fundoscopy and pupillary function and was reversible within 7 days of termination of pregnancy. Demirtas et al. found that on comparing the patients with or without MRI findings, there was no significant difference regarding headache, but there was a statistically significant difference regarding visual disturbances, depression of consciousness and seizures. We have observed patients suffering from severe pre-eclampsia and having positive cerebral findings on MRI scan, However, employing MRI for screening is not cost-effective and large-scale randomised control trials are needed to further confirm the role of MRI in severe pre-eclampsia. Roberts JM, Redman CW. Pre-eclampsia: More than pregnancy-induced hypertension. Lancet 1993;341:1447-51. Sibai BM. Diagnosis, prevention, and management of eclampsia. Obstet Gynecol 2005;105:402-10. Swain S, Ojha KN, Prakash A, Bhatia BD. Maternal and perinatal mortality due to eclampsia. Indian Pediatr 1993;30:771-3. Gabbe SG, Niebyl JR, Simpson JL, Landon MB. Obstetrics: Normal and problem pregnancies. Hypertension. 7th ed. London,UK: Churchill Livingstone, An Imprint of Elsevier; 2007. Banerjee S, Randeva H, Chambers AE. Mouse models for preeclampsia: Disruption of redox-regulated signaling. Reprod Biol Endocrinol 2009;7:4. Brewer J, Owens MY, Wallace K, Reeves AA, Morris R, Khan M, et al. Posterior reversible encephalopathy syndrome in 46 of 47 patients with eclampsia. Am J Obstet Gynecol 2013;208:468.e1-6. Hinchey J, Chaves C, Appignani B, Breen J, Pao L, Wang A, et al. A reversible posterior leukoencephalopathy syndrome. N Engl J Med 1996;334:494-500. Sanders TG, Clayman DA, Sanchez-Ramos L, Vines FS, Russo L. Brain in eclampsia: MR imaging with clinical correlation. Radiology 1991;180:475-8. Bartynski WS, Boardman JF. Distinct imaging patterns and lesion distribution in posterior reversible encephalopathy syndrome. AJNR Am J Neuroradiol 2007;28:1320-7. Manfredi M, Beltramello A, Bongiovanni LG, Polo A, Pistoia L, Rizzuto N. Eclamptic encephalopathy: Imaging and pathogenetic considerations. Acta Neurol Scand 1997;96:277-82. Adali E, Kurdoglu M, Avcu S, Yildizhan R, Adali F, Kolusari A. Reversible acute cortical blindness associated with eclampsia in complete hydatidiform mole. Ir J Med Sci 2011;180:287-90. Kanki T, Tsukimori K, Mihara F, Nakano H. Diffusion-weighted images and vasogenic edema in eclampsia. Obstet Gynecol 1999;93(5 Pt 2):821-3. McCormick AS, Wood A, Wee MY. Visual disturbances and seizures associated with pregnancy: A diagnostic dilemma and the role of radiological techniques as an aid to diagnosis. Int J Obstet Anesth 1999;8:184-8. Swende TZ, Abwa T. Reversible blindness in fulminating preeclampsia. Ann Afr Med 2009;8:189-91. Demirtas O, Gelal F, Vidinli BD, Demirtas LO, Uluç E, Baloglu A. Cranial MR imaging with clinical correlation in preeclampsia and eclampsia. Diagn Interv Radiol 2005;11:189-94.